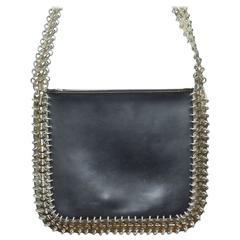 PACO RABANNE (Made in France) Iconic “69” bag comprised of silver-tone perforated chips, typical of the fashion house work in the 1960-1970’s. This piece features a flap and is decorated with a cylindrical closure issued in limited numbers at the time, which makes this iconic piece celebrities were all wearing, even rarer. 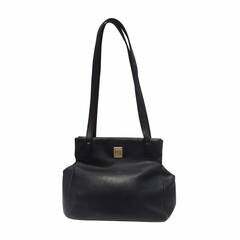 The bag can be worn over the shoulder or carried by hand. This flagship piece representing the 1969’s was re-issued in 2011 by Paco Rabanne and sold by “Comme des Garçons” and “Colette”, in the intention to recreate the “Barbarella” spirit. Model “69”, from the late 1960’s. Height 18 cm (7 in); Width 23 cm (9 in); Depth 3 cm (1.15 in); Handle length 48 cm (19 in). Very good condition. Note: light oxidation on buckle. Paco Rabanne Paris - Production R I C A F Italy dark brown shoulder bag from the 1960s. Featuring gold discs / gold toned hardware shoulder strap.